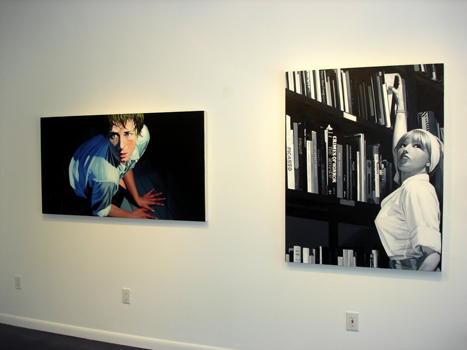 John Grande, "My Cindy, Your Cindy" (installation view). Courtesy Sara Nightingale Gallery. On view through October 4th at the Katonah Museum is Dress Codes: Clothing As Metaphor. 36 artists tackle wide-ranging issues from feminism to globalism using clothing as the medium. The list includes Art21’s Louise Bourgeois, Oliver Herring, and Do-Ho Suh. Closing this week at the Berkeley Art Museum is Galaxy: A Hundred or So Stars Visible to the Naked Eye, curated by Lawrence Rinder. The museum’s director has selected a number of works that survey the evolution of the institution’s holdings, from Albert Bierstadt, to Hans Hofmann, to Barry McGee (Season 1). Through August 30. Extended Family is currently on extended view at the Brooklyn Museum. The exhibition looks at the loose establishment that has come to define “family values” and the art world, which reaches beyond geographical and blood lines. Extended Family is culled from the museum’s permanent collection and highlights a host of artists, including Ghada Amer, Nick Cave, Vera Lutter, Louise Bourgeois(Season 2), and Fred Wilson (Season 3). In its 40th year, the venerable Rencontres d’Arles photo festival is up for a few more weeks until September 13th. Known for championing the art form that is photography, this year’s edition features a special exhibition curated by Nan Goldin, as well as this solo exhibition by Roni Horn (Season 3). Have you ever wondered how the art world would shake up if Cindy Sherman (Season 5) were a male painter, making the same images except on large scale canvases using paint? Enter John Grande, whose solo show posits this exact scenario. My Cindy, Your Cindy is up through September 3 at Sara Nightingale Gallery in Shelter Island.